We usually hire a guide for a quick tour of a new city to get the lay of the land and spend the 2nd day going back to visit areas that we would like to explore in more depth. The concierge at the hotel said that we could really do this on our own, no need for a guide. The points of interests were easy to find and very self explanatory, so off we go. Although we were a little nervous since there is not much written in English...anywhere. 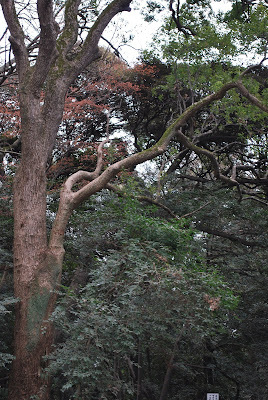 First stop is Meiji Shrine, which from my hotel window looks like the Central Park of Tokyo. It was a very peaceful beautiful walk through the park to the shrine. I can only imagine how beautiful it is in season. As we were leaving the shrine there many groups of school children entering. Check out the little faces at the end. They were so excited to have their photos taken. Each school had a different hat! Meiji Jingu is a Shinto shrine. Shinto is called Japan's ancient original religion, and it is deeply rooted in the way of Japanese life. Shinto has no founder, no holy book, and not even the concept of religious conversion, but Shinto values for example harmony with nature and virtues such as "Magokoro (sincere heart)". In Shinto, some divinity is found as Kami (divine spirit), or it may be said that there is an unlimited number of Kami. You can see Kami in mythology, in nature, and in human beings. From ancient times, Japanese people have felt awe and gratitude towards such Kami and dedicated shrines to many of them. Adorable children that were dying to have they picture taken. They are were dressed in uniform.